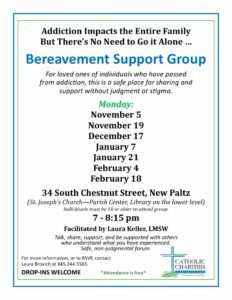 NEW PALTZ – Catholic Charities is introducing a bereavement support group at St. Joseph’s Church in New Paltz. The group, especially for individuals who have lost a loved one to the disease of addiction, will meet in the Parish Center Library (lower level) at 34 South Chestnut Street, New Paltz from 7 – 8:15 pm. The first session will be held Monday, November 5. Subsequent meetings are scheduled for November 19, December 17, January 7 and 21, and February 4 and 18. Additional dates will be announced once the group is under way. Free and open to the community, the meetings will provide a safe environment for those who have lost a loved one to addiction to share and seek support without stigma or judgment. The group will be facilitated by Laura Keller, LMSW. Registration is not required to attend the support group, but is requested for planning purposes. To register for these free sessions, or for more information, contact Laura Brovich at 845.344.5565. Drop-ins are welcome. Additional meeting dates and locations will continue to be announced.